Book of the Day > Votes for Women: A Portrait of Persistence. Published by Princeton University Press. 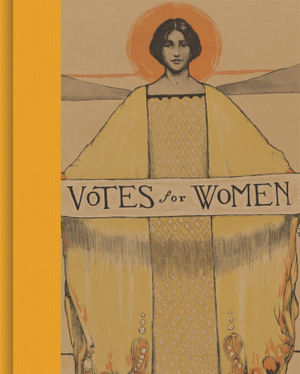 "Marking the centenary of the ratification of the Nineteenth Amendment in 1920, Votes for Women is the first richly illustrated book to reveal the history and complexity of the national suffrage movement. For nearly a hundred years, from the mid-nineteenth century onward, countless American women fought for the right to vote. While some of the leading figures of the suffrage movement have received deserved appreciation, the crusade for women’s enfranchisement involved many individuals, each with a unique story to be told. Weaving together a diverse collection of portraits and other visual materials—including photographs, drawings, paintings, prints, textiles, and mixed media—along with biographical narratives and trenchant essays, this comprehensive book presents fresh perspectives on the history of the movement. Bringing attention to underrecognized individuals and groups, the leading historians featured here look at how suffragists used portraiture to promote gender equality and other feminist ideals, and how photographic portraits in particular proved to be a crucial element of women’s activism and recruitment. The contributors also explore the reasons why certain events and leaders of the suffrage movement have been remembered over others, the obstacles that black women faced when organizing with white suffragists and the subsequent founding of black women’s suffrage groups, the foundations of the violent antisuffrage movement, and the ways suffragists held up American women physicians who served in France during World War I as exemplary citizens, deserving the right to vote. With nearly 200 color illustrations, Votes for Women offers a more complete picture of American women’s suffrage, one that sheds new light on the movement’s relevance for our own time."